Just a forewarning: this is going to be a lengthy post, but it’s worth it. So sit back, grab a beverage, and say “goodbye” to lame old PowerPoint “presentations.” You’re moving up to creating “effective, interactive PowerPoint experiences.” Yup, I went there. If you don’t like reading, or if you’re a visual-sort-of-hands-on learner, you can download my “hyperlinking made easy” Powerpoint here. Using hyperlinks is one of the coolest – and most often overlooked – techniques in creating effective, interactive PowerPoint experiences. You know hyperlinks: they’re the blue text embedded on websites that take you to other websites, like this one that links to Yale University’s open course on macroeconomics. 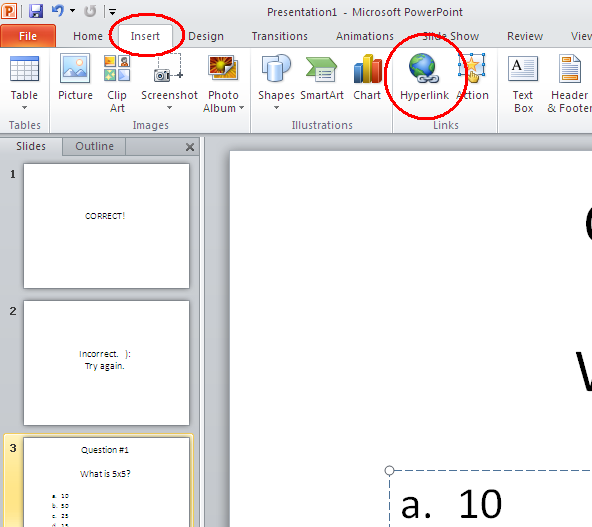 PowerPoint can use hyperlinks too, allowing you to link different slides within the same presentation. Nifty, huh? Most of the time we think of PowerPoint as being a linear presentation. We start with the title slide, then click to slide two, then three, then there’s some annoying text animation and a flashy transition, then slides four, five, and six. Using hyperlinks turns your PowerPoint into a more interactive experience, and opens the way for a LOT of cool options for teachers and students. Ridiculously simple, eh? Let’s look at an example. (You can download the example Hyperlink Practice Slides and try at home! Or, if you don’t have Office 2010, download the 2003 version). Here’s the scenario for our practice: you’re a math teacher, and you’re creating a multiplication review game for your students. Step 2 – Create the destination slide(s). In this case, we need both a “correct” and an “incorrect” slide. Step 3 – Linking the slides. This takes some explanation. 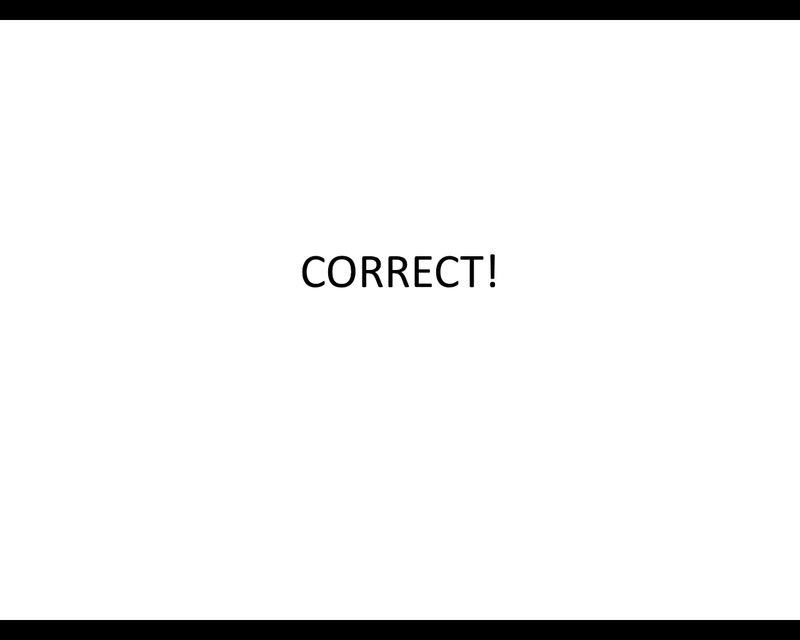 First, highlight the text of the correct answer (HINT: it’s 25). Then, along the toolbar at the top, click the “insert” tab and click the blue globe that says “hyperlink” (or you can right-click on the highlighted text and click “hyperlink” from the menu – either works). When the box comes up, make sure you select “Place in this document” – it means that you’re linking to another slide in this presentation. 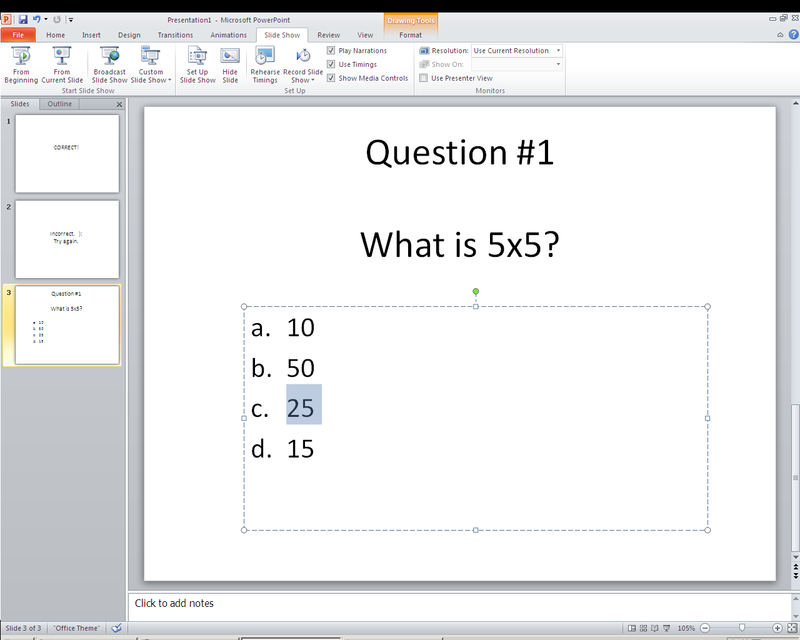 Select the slide you want the answer “25” to link to (i.e. the “correct” one), and click ‘ok’. Congratulations! You’ve just hyperlinked your first PowerPoint slide! 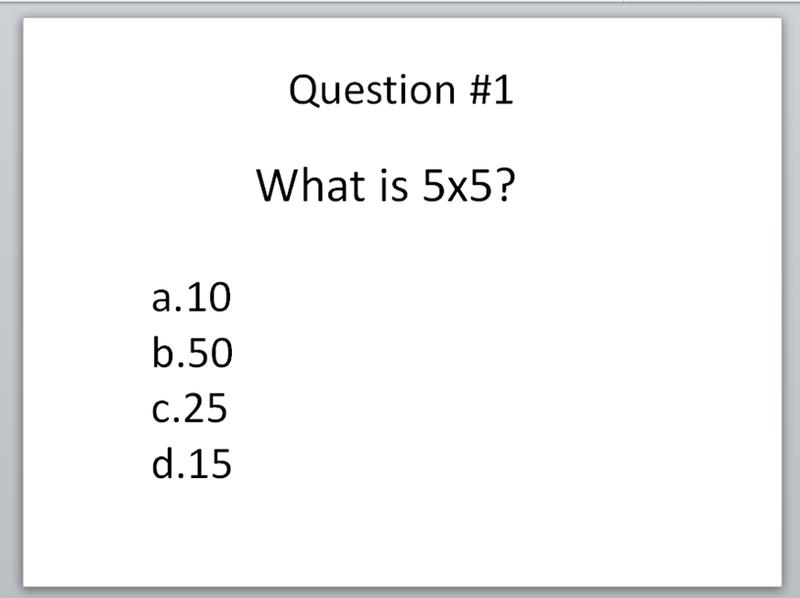 Now you can go back and highlight the other three answers and link them to the “incorrect” slide. When you run the slideshow after hyperlinking the answers, the original problem should come up with all answers highlighted in blue. 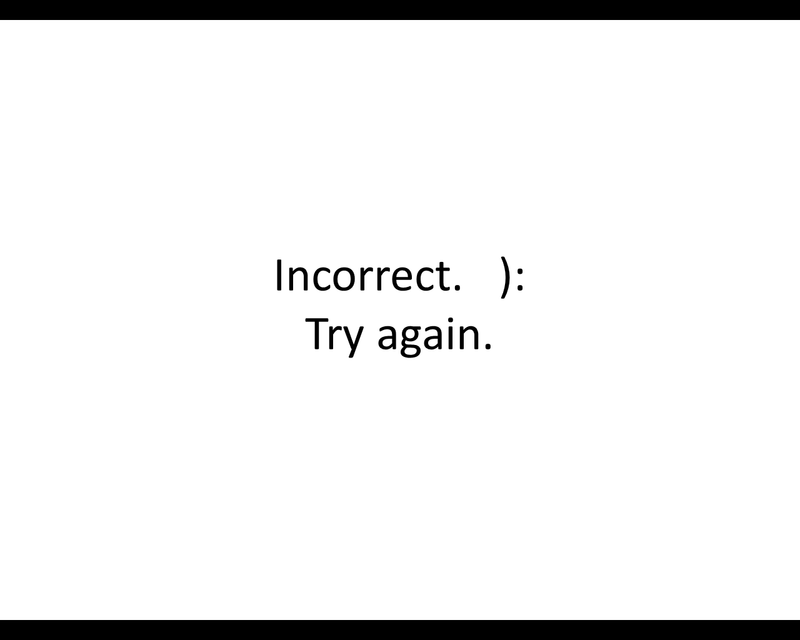 When you click on an answer – MAGIC HAPPENS! – and you’re taken to the corresponding “correct” or “incorrect” slide. Well let’s say that you want your students to have another chance to answer if they get the question wrong. 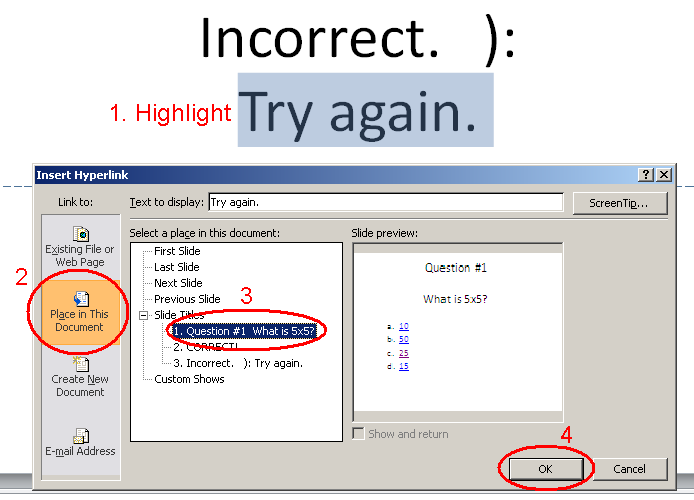 Go to the “incorrect” slide and highlight “try again.” Now hyperlink that BACK to the ORIGINAL problem slide. 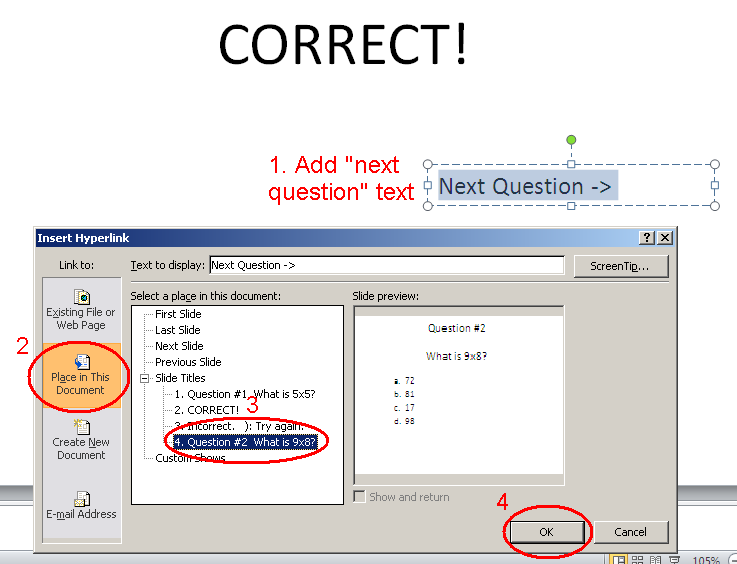 Or, if the student gets the question correct, give them a link to the next question by inserting a text box near the bottom of the “correct” slide that says “Next question.” Then hyperlink to the second question slide. Now you’re pretty much a hyperlinking expert. Just be aware that you’re not limited to question/answer text-based hyperlinking. You can hyperlink pictures and shapes; you can hyperlink from your PowerPoint presentation to outside Internet sites or documents (just click “Existing File or Web Page” instead of “Place in this Document” on the hyperlink screen). There are plenty of possibilities. Play around with them. So…What else is this good for? This has dozens of applications in EVERY content area. With hyperlinking, you can create Jeopardy-style review games for your students. Just insert a table, label the categories, insert the point values, make slides for each question, then hyperlink the point values to individual questions. One important thing to remember, however, is to create a hyperlink BACK to the Jeopardy board after you’ve linked to a question. I like to insert a little circle shape in the corner to link back. You can download an example of one of my Jeopardy games. The other nice thing about using hyperlinks for a Jeopardy game is that previously clicked links will turn purple, so you’ll know which questions have already been used. Students love those little “create your own story” books. The premise is to give the reader choices about how he or she gets through the book. Students (or teachers) can make their own “create your own story” with PowerPoint hyperlinking. Give your reader a couple of paragraphs (or a couple of slides’ worth of text) and then give them a choice – hyperlink text that brings them to a new slide that changes the story based on the decision. Not only is this a fun and creative way to write a narrative, but it also utilizes technology and forces students to think critically about how they’re arranging their stories. Here’s a simple Create your own story example. Everyone remembers drawing diagrams in science: the rock cycle, the water cycle, the Kreb’s cycle, the nitrogen cycle…it seems like everything has a cycle in science. Hyperlinking brings the traditional paper-and-crayon diagram into the 21st century! Draw a picture of the cycle (MS Paint works well) and then insert the picture into a PowerPoint slide. 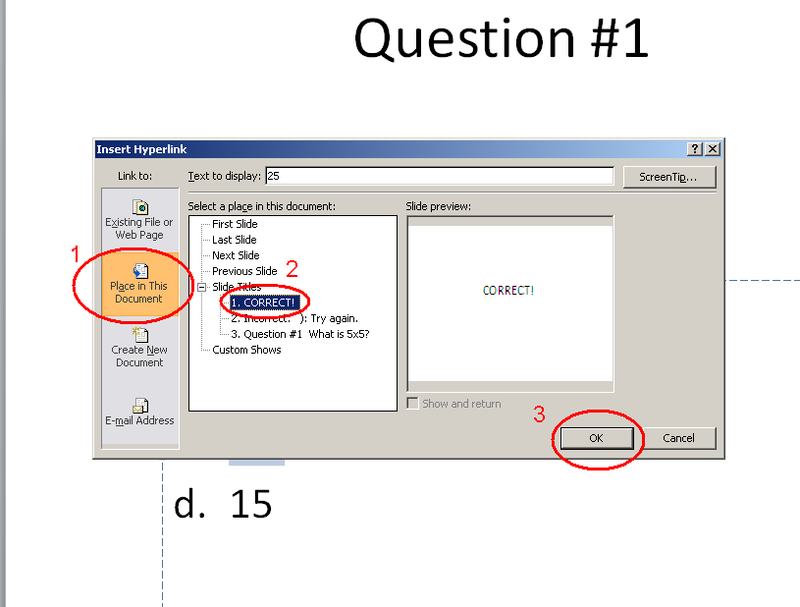 Insert text boxes for numbers and link each number to a slide detailing that step in the cycle. Here’s a simple Water cycle example. Hyperlinking can also jazz up lame collages. Ask students to create a collage of pictures about a book or concept on one slide, and then hyperlink each picture to a slide that gives an explanation for the picture. Here’s a simple interactive collage example for Lois Lowry’s The Giver. Now, go make amends to your students for all the terrible, terrible PowerPoint presentations you’ve made them endure. Give these new strategies a try, use them in your classroom, and teach your students how to use hyperlinks in their own presentations because – let’s be honest – their presentations are awful too. This entry was posted in Fun Stuff, Lessons, Tips and Resources and tagged education, English, hyperlinking, hyperlinks, powerpoint, teaching. Bookmark the permalink.